This is the first film in the start of my 1940’s Series, dedicated to helping me learn a bit more about the films and the film-culture surrounding the 1940’s. 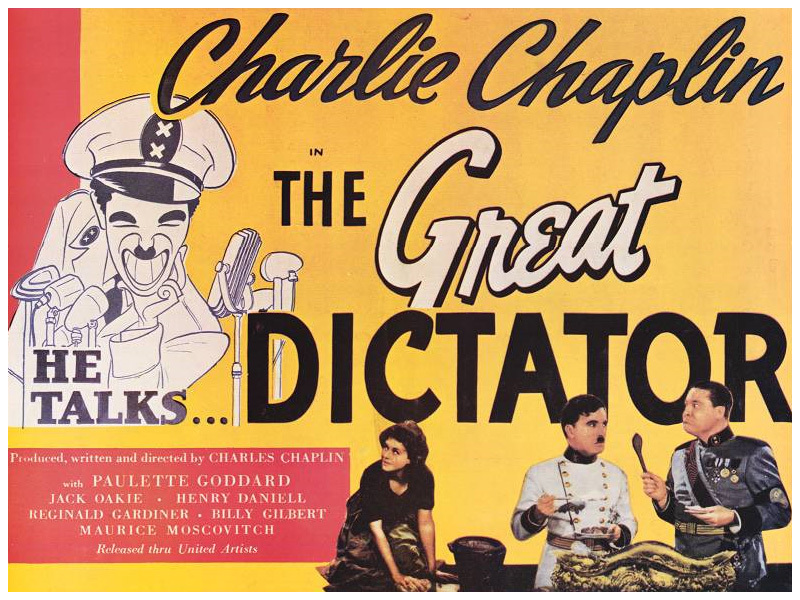 Directed by Charles Chaplin, The Great Dictator is an american satirical, political, comedy-drama film. And super special because it was starring, written, produced, scored, and (already said ) directed by Mr. Chaplin himself. It starts out at the end of the first world war, Chaplin himself plays the role of this Jewish Barber character (he doesn’t have any other name). His character stumbles through the trenches, in this comedic fashion and only for the soul purpose of getting the viewer to smile and laugh. The Barber, hearing pleads for help and seeing this tired officer, tries to be the good guy by climbing into a plane, and eventually taking off, as soldiers shoot at them. The man the Barber saved, is named Commander Schultz. He shares that he has dispatches that could end the war. Though, as the film would have it, the plane loses fuel and they crash into a marsh. Both surviving, but the Barber has lost his memory. Medics arrive, they are taken to the hospital and told that the nation he was fighting for, has lost the war. Fast forward a couple years, the Barber is released from the hospital and we have the big introduction of Adenoid Hynkel (also played by Chaplin). Adenoid is the dedicated dictator of Tomainia, and he has taken the ruthless job of persecuting every Jew he can. He has a posse of equally loyal men. This is where the huge parodies of Nazi Germany come into play. We have Chaplin, mocking the German language at times, speaking gibberish if anything, and having an English voice over. It’s definitely comedic. The Barber returns back to his work in the Ghetto and is totally unaware of what’s going on politically in his country. He’s offended that these men would paint “Jew” on his store front windows, and proceed to confront them. These men turn out to be the infamous Storm Troopers, the official policing officers of the dictator, and they didn’t take too kindly to the offence. The Barber only got out, with help from this young woman, Hannah. Eventually though, a whole small army of the thick headed men come looking for the two of them, getting ready to lynch them… But just by luck, the man he saved earlier in the film (Commander Schultz. ), recognizes who the barber was and tells them to immediately stop. Schultz escapes, heads to the ghetto, plans a plan with the Barber, Hanna and others to overthrow the dictator. One plan being a suicide mission of blowing the place up. Though, while choosing the magic man to do the job (they were going to find a surprise coin in their desserts), Hannah purposely messes up and puts a coin in everyone dish.. The ghetto is later searched by storm troopers and everyone is taken away. To Camp. The rest of the film is the eventually staircase down. Hynkel is having a hard time trying to invade a neighbouring country, even willing to go to war with another country that is thinking of doing the same. There is this hilarious exchange, where Hynkel invites the countries leader+wife over to discuss who will invade, and it just ends in a mess. Though Mr. H does win, and he proceeds to invade. The two boys escape from camp wearing official uniform and being that the barber looks exactly like the dictator, he gets away with a lot. While this is happening, the dictator is taking a break from his day job and goes duck hunting,but he is then mistaken for the Barber and taken into custody. The Barber plays the role of the dictator until the end. The end being this dramatic, warm hearted speech, that revokes all the previous words of the evil dictator. He calls for humanity to use science positively, and to stir away from dictatorships. People hear this speech over the radio, microphones, everywhere. They get teary eyed and rejoice. He even mentions Hannah at one point specifically, and of course, this just grabs her heart. The films ends in this almost stereotypical perfect ended of everything is going to be alright, so don’t worry about it. Though, what I really liked about the film,was how light hearted he was about the entire situation. I think his (Chaplin’s) ignorance really made the film what it was. Apparently Chaplin didn’t know about the specific situation going on in Germany at the time and have stated on record that he wouldn’t have made the film if he had known. Personally, I’m glad that wasn’t the case. It was a work of art that mixed hilarity, with at the moment history. It’s hard to get away with that. Or at least it would seem that these days, it would be difficult to. I also liked how recognizable the humour was for me. For some reason, I thought I was going to be laughing at something a lot different from what I’m use to now, as a white girl sitting in 2014. But yet, I enjoyed myself. I think this was an excellent first choice of the year 1940. 4 thumbs up! + I made the mental note of watching more Chaplin films.